WHEN WAS THE LAST TIME YOU EXPERIENCED SOMETHING UNFORGETTABLE? We are MALLORCA PRIVATE TOUR GUIDES, all official licensed tour guides with at least 20-plus years in the business, we know just the best places to show you, to make your vacations unforgettable and provide the maximum enjoyment. MALLORCA PRIVATE TOURGUIDES was started by a small group of concerned Tour Guides committed to the highest possible proficiency standards for persons working in tourism in the greater island of Mallorca. This group of enthusiastic TOUR GUIDES, local experts will delight you with their wit and knowledge. We give a human face to Travel, the joy of personal contact. All our knowledgeable TOUR GUIDES have had many years of experience guiding in Mallorca speak a wide Range of languages, approachable and flexible to your needs and wishes. Our tours are not run on ” rails” so if you want to see a particular monument or you want to stop to take some pictures, take time out for a coffee break, then just let us know. All our TOUR GUIDES are exclusive dedicated to ensure that you find your tour and visit to the town and/or Island as extremely enjoyable and a rewarding experience that you will remember for a long, long time. 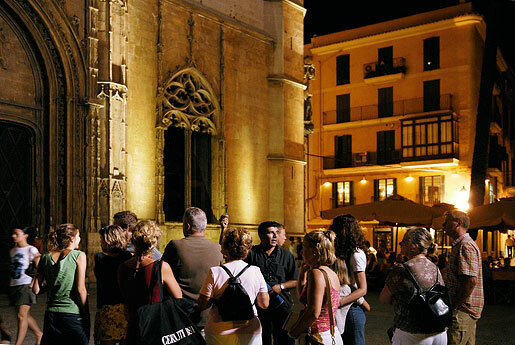 Our customized, tailor made tours will show you Mallorca like no one else. Let us guide you through the Island and you will never forget it. Our tours are more personal and let us to move at your peace. Our private tours are a perfect way for you, your family, your friends to experience the beauty and the splendor of this Magical Island, Mallorca. Our policy is to ensure you have the most enjoyable vacations, we understand the importance of your vacations, your time away from it all, and we think it should be the best vacations it can possibly be- it’s our company compromise. Our knowledge of the island Mallorca, is extensive, our wide experience, and our attention to logistic impeccable, with our Tailor made tours you are on the way to discover Mallorca….quiet villages, beautiful scenery, colorful landscapes, hiding places, enjoying our gastronomy…..this is the real Mallorca, the Majorca we would like you to experience, our island is steeped in history, and in every town, in name and place, there will be a history to tell you. Our target: provide you THE BEST SERVICE. SEE THE ISLAND LIKE, WE THE LOCALS SEE IT. Drop us a line telling us what you would like to visit, when do you want to do it and how long you want to stay, and leave all the rest to us, our experience TOURGUIDES Group will prepare a Tailor made trip for you, do not worry about Ground transportation, entrances, itineraries….our company has very good connections with bus companies, venues, Monuments, Restaurants, . . .
Our services include many types of unique tours, and customized services. Trips are related to a wide variety of interests or preferences like: Wine,food, culture, golf,Spa, Honeymoons, Romantic getaways, City breaks,VIP private guides, shopping experiences, small Groups, family meetings, Incentives, congress, airport transfers, special events … We work with most of the tour operators, DMC, Cruise companies, Hotel Concierges, travel consultants. Our satisfied guests are the example of our premium services. We have participated as guides in car lounges like Porsche, Mercedes Benz, Opel, Audi, Renault and Smart. The extremely exclusive RIVA-regatta. We have attended thousands of tours for cruise passengers. The management of our team has extremely good contacts with the Local Government (Presidency and Tourism Department), Port Authority and the local Town Hall (Mayor and Tourism Department) just like different Town halls all over the Island, a real Captain of Tourism Industry of the Island of Mallorca. Our aim is to offer you an unforgettable experience of our Island or Port of Call. For this we use to offer the best available services. You can book the PRIVATE GUIDE SERVICE of if you want us to do so, we also have our regular ground transportation company. Going from a car with driver to a rental car that you can drive yourself.